The first key challenge for any production is the equipment. The next major influence is the conformal coating material itself and how it affects the selective conformal coating production process. First of all the conformal coating is a liquid! This single fact, that there is a certain level of uncontrollability about the material flow, is the most important point. What we now want to identify are all the factors that affect this chaotic flow. Then we can control them. Leave them uncontrolled and expect the coating to do things you don’t want it to do! So, lets consider the factors that influence the material itself and therefore by association affect the material flow. Lets explore these factors more. Consider each factor on an individual basis. So, if we consider that when the coatings are made there are several manufacturing tolerances in the production process then we have our first factor that affects the application process. That is the conformal coatings viscosity. Whether the coating is diluted with solvents or is 100% solids material (this is defined as no volatiles are evaporated from the coating during drying / curing and 100% of the coating applied stays on the board) then the viscosity can affect the production process. How Does Viscosity Influence the Conformal Coating Process? Well, it’s pretty straightforward. Change the viscosity of a coating and you change its ability to flow. Think of hot and cold oil and how they flow differently. This change in viscosity can increase or decrease the amount of coating being applied and also how it actually migrates around the PCB. Therefore, this is important. How Much Error is There in the Viscosity of the Conformal Coating Material When Manufactured? Typically, a manufacturer can give viscosity errors of 10-20% for the conformal coating . This is reading straight off a Technical Data Sheet for the material. The answer is simply YES it does. Even worse, this flow rate change can be enough to overflow boundaries set of 1-2mm when applied to PCBs and really affect coating patterns. Therefore, controlling the viscosity is key to good processing. So, how do we do this? This is reviewed in the next section on blending. So, we know the coating viscosity matters. Therefore, we have to control the viscosity of the conformal coating. We can do this in two ways. We can buy in pre-blended coating from the manufacturer that is pre-blended accurately, to provide a consistent value. Is It Easier to Mix Your Own Conformal Coating for Spraying In House or Buy Preblended Conformal Coatings? Well, to blend your own conformal coating isn’t that easy. First off you need a measurement system that can measure the coating accurately enough. Flow cups are okay in most cases but aren’t that accurate for robotic applications where minimising the viscosity error is the main goal. That leaves the viscometer. Unfortunately, this is not a low cost or low-tech device and therefore investment in time and money is required. However, it will give you good results. So, this is a good option. The second option is just to buy the pre-blended product. In the end the cost is approximately 10% extra on the actual coating material and considering the amount of scrapped or reworked PCBs that could be generated for a change in viscosity this could be a good investment. So far we have seen that viscosity is a pretty important factor in process control of the coating material. It will be no surprise then that the environment can also affect the conformal coating viscosity through a change in temperature. This is because as conformal coatings get warmer their viscosity lowers too. This lowering and rising of viscosity due to temperature change can be highly detrimental to material flow through the valves and needs to be understood, and if possible, controlled. How Does Temperature Variation Impact the Conformal Coating Process? So, How Long Before Problems in Your Conformal Coating Process Occur Due to Temperature Fluctuations? Well, there are many factors to consider including material type, temperature variation, circuit board design etc. But, a temperature swing of 5-8 degrees without a correction in the material flow on the valves probably will cause problems on the board! If you have even more temperature swing than this then expect to be adjusting the material flow regularly, especially if you are trying to achieve tight tolerances. How Do You Manage Temperature Variations Affecting Conformal Coating Viscosity? Well, there are a couple of good options. First, control the environment so the temperature doesn’t vary. Good climate control will help all the processes concerned. Second, raise the temperature of the coating above the highest ambient temperature that is normally achieved. Therefore, the coating is always at a fixed temperature regardless of the environment around it. This can be added as an option on the machine and is a good process control tool to ensure viscosity change due to temperature fluctuations is minimized. Finally, the other main environmental factor that does influence coating is humidity. High humidity and conformal coating don’t mix very well. This is especially the case for humidity sensitive coatings like silicone RTVs, which use moisture to cure. However, most conformal coatings can absorb moisture and suffer from an affect called Blushing (Blooming) and so again humidity control can be important. This can especially so where high humidity occurs naturally and complaints tend to double about problems with coatings in the rainy season of some countries! We have seen that viscosity for a conformal coating is a prime factor for ensuring good coating. Another factor that is critical is the compatibility of the conformal coating with the circuit board materials. Ideally, we want the materials on the circuit board (laminate, resist, components, flux residues, adhesives and RTVs) to have zero impact on the circuit. This is rarely the case! Flux Resides: Is your flux compatible with the coating? Wow, a whole topic on its own. But, residues can cause conformal coating defects such as de-wetting and delamination of the conformal coating away from the circuit board. 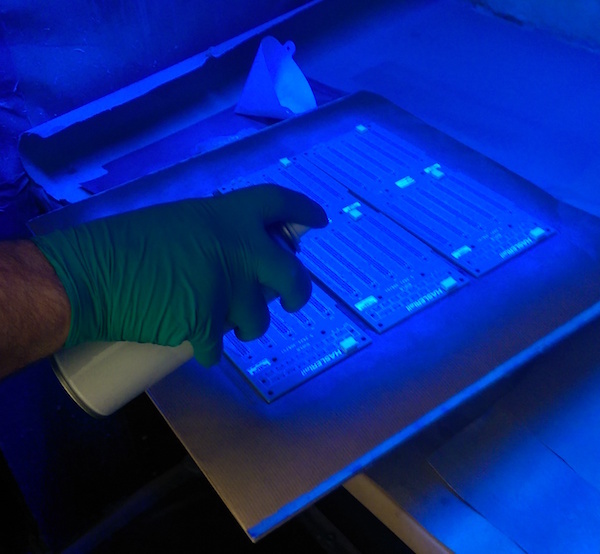 Adhesives and RTVs: A separate section encompassing all “gloops” added to PCB before applying coating. Want to stick an acrylic coating to a silicone RTV used as anti-vibration on a PCB. Good luck. Care has to be shown when checking compatibility with materials. Care also has to be shown in controlling these other materials downstream before the application. One final topic that affects production is the Conformal Coating / Machine Compatibility. Does your conformal coating like the machine and work well with it? Does it clog up pipes, dry in the wrong places, change viscosity as it cures in the system or just wear out parts which then makes processing even harder? Well, no surprise. Some conformal coatings do attack machines or do their best to mess them up. The simple answer is to choose materials that do the least harm. The second easiest solution if you have no choice is to ensure there is really good preventative maintenance, good housekeeping and operators that care. In conclusion one of the prime factors that affect processing with conformal coating materials is viscosity. Control this from the start to finish whether that’s from blending to the production process then you will minimise the impact of the coating on the finish. Then all you need to do is ensure that the coating is completely compatible with the circuit board and that you rigorously control your process, maintenance schedule and operators. Simple.